A surface-to-air missile regiment equipped with the brand-new S-400 air defense system, Russia’s most advanced, has come on duty in Moscow’s suburbs on combat alert. “The SAM combat squads of the Moscow Region aerospace forces have put the new S-400 Triumph air defense missile system into service, and have gone on combat duty for the air defense of Moscow and the central industrial region of Russia,” the Defense Ministry’s Department of Information and Mass Communication told Interfax. 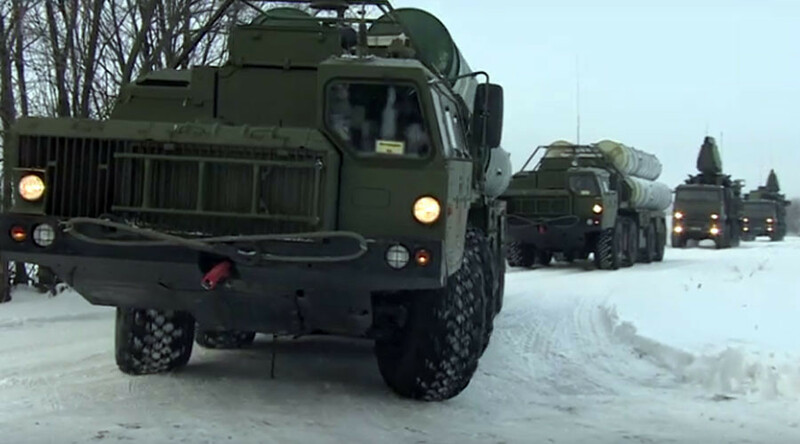 In December, the new SAM system arrived at its destination in the Moscow Region from Kapustin Yar in the south Russia, where drills at a military test range went successfully, the Defense Ministry noted. “The main task of the anti-aircraft missile troops of the Russian Aerospace Forces is air defense and protecting vital state, military, industry and energy facilities, as well as the Armed Forces troops and transport communications, from aerospace attacks,” the ministry stressed. The Triumph system, which was developed by air-defense systems manufacturer Almaz Antei, is designed for high-efficiency protection against airstrikes utilizing strategic, cruise, tactical, and other kinds of ballistic missiles. The new system is capable of hitting moving targets in the air, including planes and cruise missiles, at a distance of 400 kilometers, as well as ballistic targets moving at speeds of up to 4.8 kilometers per second at altitudes ranging from several meters to several dozens of kilometers. Four more Triumph units are to come into service in 2017, Russia’s Defense Ministry said. S-400 Triumph air defense systems have been providing air cover for Russia’s forces in Syria since November, when President Vladimir Putin order their deployment. “With these complexes, we are able to destroy both sea and ground targets” at distances of 350 kilometers for sea targets and nearly 450 kilometers for ground targets, Russian Defense Minister Sergey Shoigu said at the time. In October, President Putin and India’s Prime Minister Narendra Modi signed an agreement for the sale of S-400s to India. Deliveries could begin in 2020.